Started and overseen by Etsy sellers Stellaloella and DecadenceDesigns, "The Etsy traveling journal is mail-art project. A handmade journal is passed from one Etsian to another, via the mail. Each participant gets a full spread in the journal to create, embellish, draw, paint, write, whatever they want. Then they pass it along to the next person until the entire book is filled. ... Each book starts as a medium-format, hardcover blank sketch book. It will come with a companion writing journal to include your thoughts and experiences on the project. The finished books will be donated to the Library at the Etsylabs in NYC. We will have this blog set up to track the progress of the book, updated with images of each spread: http://etsyjournal.blogspot.com/ " (quote taken from the journal blog site). I am lucky enough to have had a chance to participate. My collage is in Book 2, pages 11-12. The traveling journal arrived just a couple weeks shy of my five month Etsy 'anniversary.' Since signing up for this project I have wondered what I would create when my turn came. 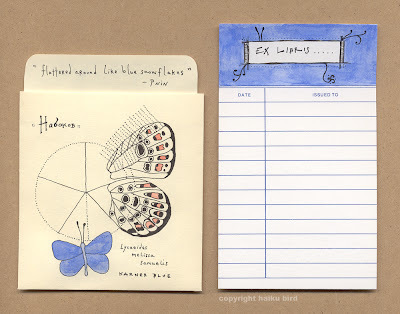 Last fall, essentially out of the blue, I began drawing hummingbirds using colored pencils and acrylics, and pairing them with haiku assembled from text cut from old books. In December I opened my shop in order to sell these drawings. 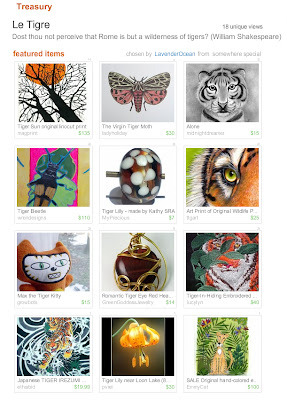 Over the five months of running my shop I have striven to create artwork as often as possible. My media and subject matter have increased and diversified. 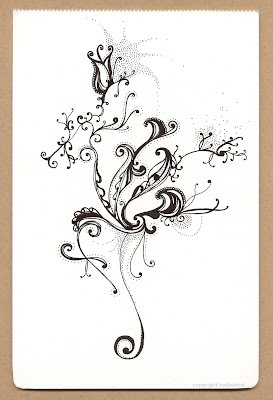 This collage includes a pen & ink drawing of a hummingbird perched on a cloud in the semi-abstract style I have developed. 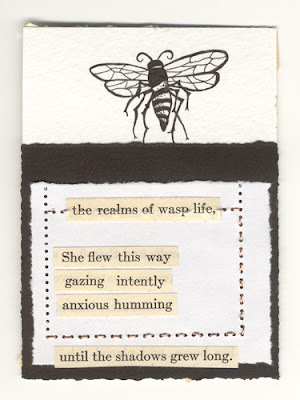 It includes an ACEO with a cut-paper haiku -- I have found making ACEOs in all kinds of mixed-media quite addictive. 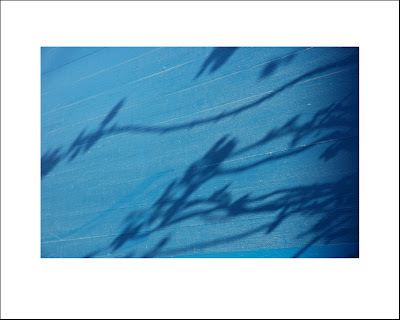 And finally, it includes a photograph called "Blue Shadows" that I took in San Francisco. Photographs are the newest addition to my shop. These pages represent my evolution as an artist, and the outlook I try to uphold -- do something creative every day. 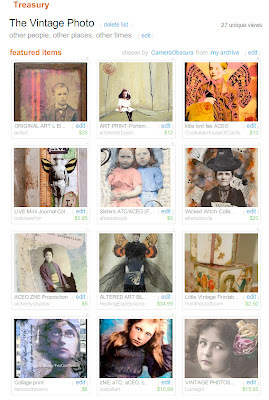 This is an original, one-of-a-kind mixed-media ACEO ("Art Card, Edition and Original"). It is based on the design of the card game Quiddler, which is a bit like Scrabble, but with playing cards. The goal of the game is to form words with your hand and get the most points. Different letters and combinations of letters are worth different amounts of points. The original Quiddler deck has designs of letters inspired by Celtic manuscripts from 500-800 AD. 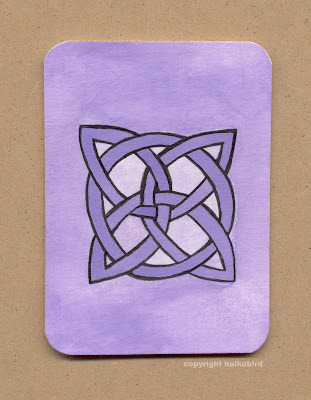 This card features a "Tu" combination that I adapted from "The Book of Kells," one of the manuscipts that Quiddler references, although there is no actual "Tu" card in the game. Pen & ink and gouache on a double layer of 140 lb Canson watercolor paper. The back will be initialed and dated by the artist. 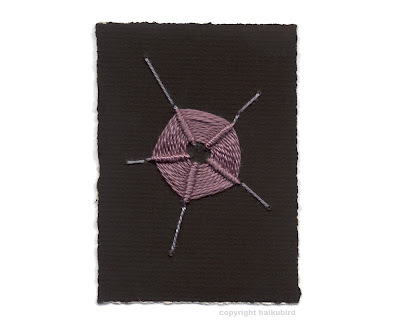 3.5 x 2.5 inches (standard ACEO size) with rounded corners. 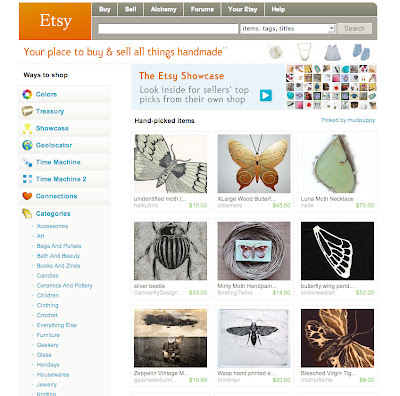 it's an Etsy thing . 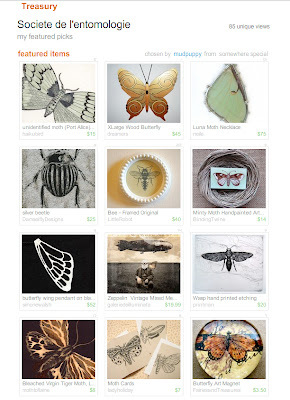 . .
My Unidentified Green Moth, from the treasury below, made it on to the front page today. Below is the original treasury, before it made it to the front page and changed slightly. 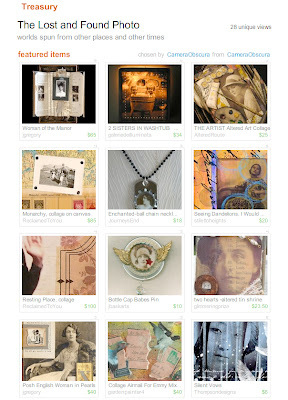 On another note, here is a treasury I made to help promote my new Etsy shop that will sell vintage photo reproductions, CameraObscura (also TheCameraObscura on blogspot). 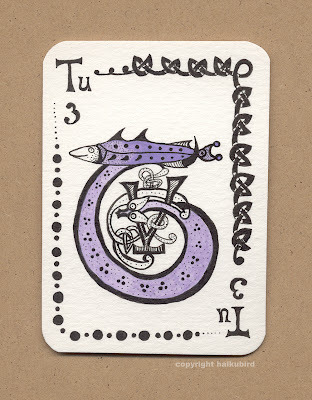 And here is another treasury by my favorite person in the universe, which hapens to feature my Quiddler-inspired Celtic ACEO card, that I made for fun. 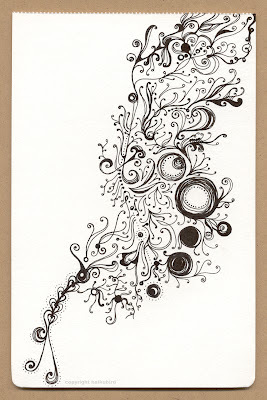 This pen & ink drawing is part of my "Sketchbook for Charity" project. Like many artists, I spend a lot of time drawing in a sketchbook. Until now I haven't done anything with these drawings. Then I realized that through Etsy, I could sell them, and give that money to charity. When you purchase this drawing, $20 will be donated to First Book, an international nonprofit organization that gives children from low-income families the opportunity to read and own their first new books, and provides a supply of new books to children participating in community-based mentoring, tutoring, and family literacy programs. For more about First Book, visit their website at www.firstbook.org. This is an original page from my 8 x 5 inch Moleskine watercolor notebook. 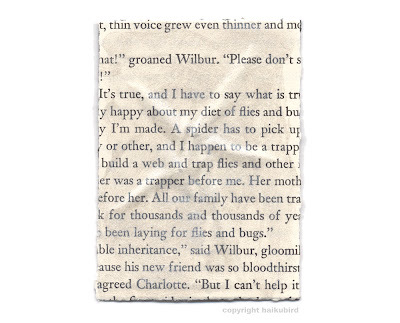 It comes "as is," meaning untrimmed, and with the perforated edge at the top; I think it would look interesting left this way, as a page, and floated in a frame, but it can be trimmed or matted to have straight edges. This drawing is priced at $23. 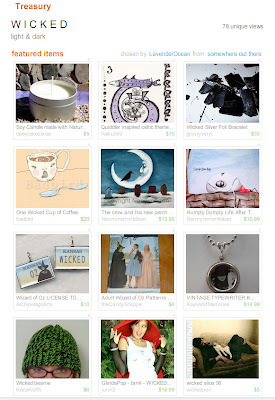 $3 is to help me cover the costs of Etsy, Paypal, and supplies. When you pay for this drawing, I will turn right around and donate $20 to First Book via their website. You will be sent a copy of confirmation of this donation with the drawing so that you can be sure your money was indeed donated. $20 is enough to provide EIGHT new books to children in need. You get a nifty little original drawing, and eight children receive their very own brand new books to read and cherish. How can you lose? 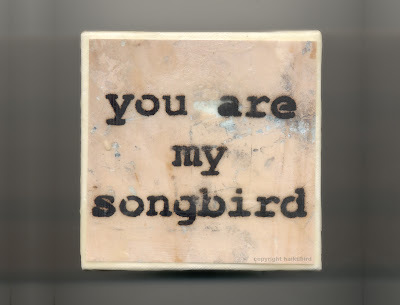 This is a beeswax collage on canvas made from my photograph "you are my songbird." The photo is of a work of stencil street art -- beautiful graffiti on a city wall. 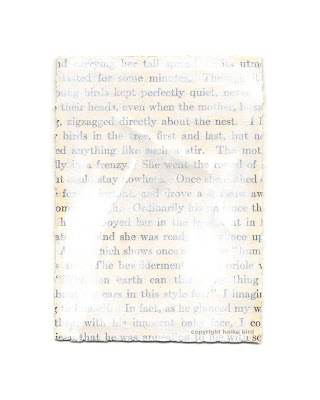 The photograph is affixed to and covered with layers of beeswax. The beeswax is the "clear" as opposed to the yellow-toned sort, and adds a soft, dreamy texture to the image. Click on the the detail photo to enlarge it and see how the beeswax adds a subtle yet pleasing effect to the image and the canvas. Media: photograph and beeswax on canvas. Size: 5 x 5 x 1.5 inches. This collage is on a gallery profile stretched canvas, 1.5" deep: heavy duty canvas, staple-free edges, tailored corners. No need to frame this piece -- the sides and back are painted with beeswax as well and it is ready for hanging; it even stands by itself on a table-top or shelf. Buy this photo from the haiku bird shop at etsy.com: haikubird.etsy.com. 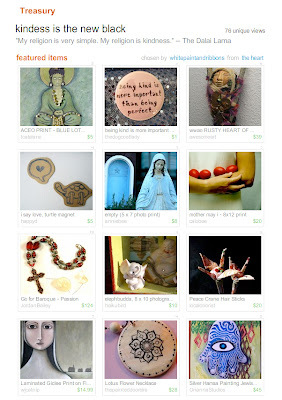 I was fortunate enough to have my sidewalk mandala photograph included in a treasury that the Etsy Administrators chose for the site's front page. Happily, someone bought it. 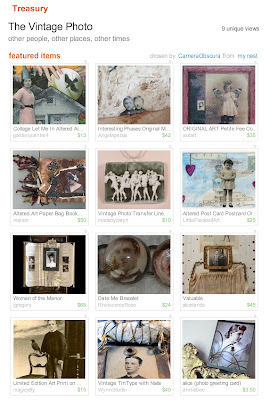 I'll be selling reproductions of vintage photographs for mixed-media artists to use in their creations. See my shop and the shop's blog for more information. 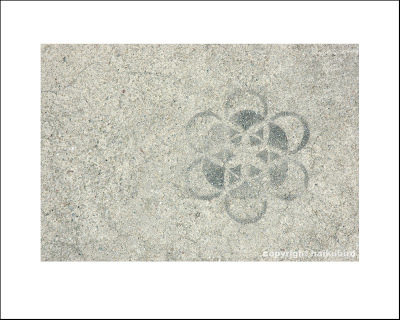 This photograph is of a mandala stenciled on the sidewalk. I've seen it nearly every day for a year and every time it brings me joy. The term mandala (Sanskrit for "circle," or "completion"), is variously used to describe Hindu, Buddhist or other religious art-objects; mandala has also become a term for any plan, chart or geometric pattern that represents the cosmos metaphysically or symbolically, a microcosm of the universe from the human perspective. A mandala may be used during meditation as an object for focusing attention. Depicting one's personal mandala in pictorial form can help one visualize the state of one's spiritual life. 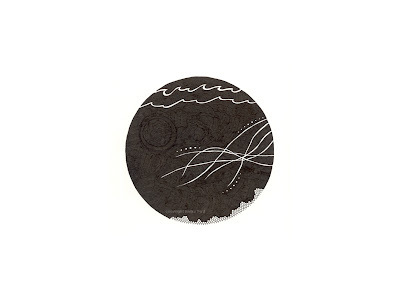 This is an open edition print. It is professionally printed on matte-finish Fuji Crystal Archive paper, that, quoth the lab, "with its 108 year rating ... will last for generations to come." Each print is inspected and approved by me prior to listing, and is signed & dated on the back. The image itself is 5.5 x 8 inches, printed on 8 x 10 paper for a nicely-sized white border. It does not need to be matted to be framed, though it can be. 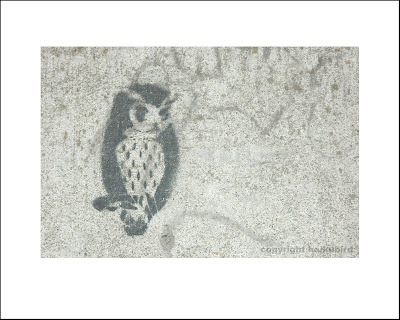 A sweet, small owl stencil painted on the sidewalk in a residential neighborhood of Oakland, CA; presumably quite wise, having seen many things. 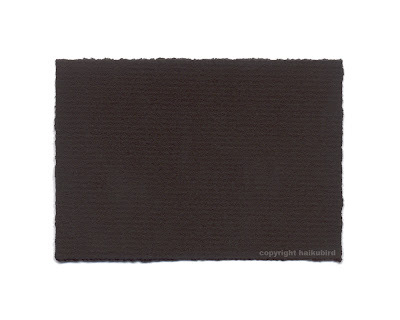 The image itself is 5.32 x 8 inches, printed on 8 x 10 paper for a nicely-sized white border. It does not need to be matted to be framed, though it can be. Franz Kafka -- b. 1883, Prague; d. 1924, Vienna. 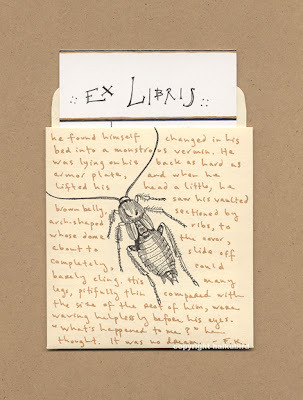 This ex libris is a tribute to Kafka and his book The Metamorphosis. Media: Pen & ink and metallic gel pen on a new set of an authentic library circulation card and manila pocket. Size: the card is 3 x 5 inches; the pocket is 4.5 x 5.5 inches. The set comes with an extra blank circulation card should you wish to include a personally inscribed card in the pocket with the ex libris card. 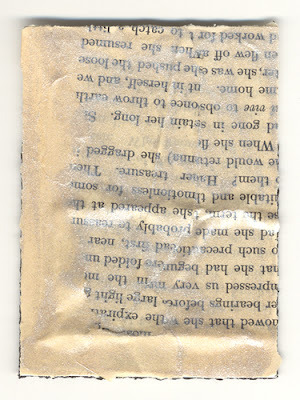 It also comes with a 1.5" x 1.5" piece of non-toxic, acid free, transparent double-sided tape-like adhesive that can be cut into strips or squares and used to affix the pocket in a book. The back of the circulation card is signed and dated by the artist. 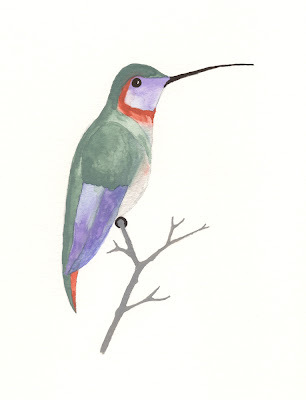 Buy this piece from the haiku bird shop at etsy.com: haikubird.etsy.com. Created by my favorite person in the universe. 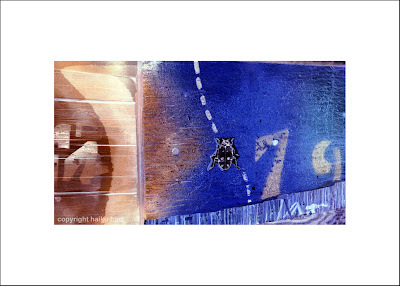 This original ACEO is made from photograph taken of an assemblage-type mural in San Francisco's Mission District. Since the image is cut down to size from a larger print and has a decorative back, more may be made but no two will ever be identical. The photo is professionally printed on matte-finish Fuji Crystal Archive paper, that, quoth the lab, "with its 108 year rating ... will last for generations to come." The back of the card is black Canson drawing paper, torn at the edges to create a "deckle" effect visible from front and back. The back will be initialed and dated by the artist. 2.5 x 3.5 inches (standard ACEO size). From my 8 x 5 Moleskine watercolor sketchbook. 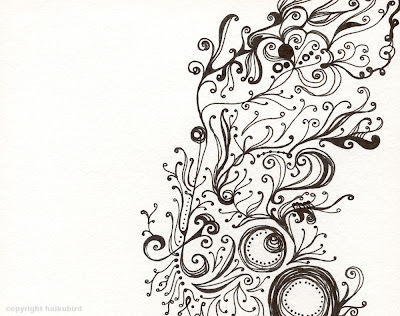 Pen & ink. Completed 30 April 2007. Inspired by memories of the classic children's book Charlotte's Web, this is an original, one-of-a-kind mixed-media ACEO ("Art Card, Edition and Original"). The web itself is sewn into the card (not just stuck on). With the exception of a little gouache, used sparingly, on the Nabokov ex libris, this is my first gouache painting. Gouache on 140lb Canson Watercolor paper; image size about 7 x 5 inches. 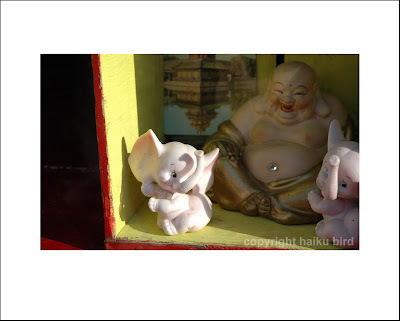 I have decided that all proceeds from sales of this photo will go to The Elephant Sanctuary. $10 from the sale of this photograph will be donated directly to The Elephant Sanctuary, a 4-star rated charity by Charity Navigator. When you purchase this photograph, I will immediately donate $10 to The Elephant Sanctuary online. Printed confirmation of the donation will be included in the package you receive. Vladimir Nabokov (b. 1899 St. Petersburg, Russia; d. 1977 Montreux, Switzerland) was not only a brilliant author but an avid lepidopterist. He took great pride in his scientific work and wrote extensively about his research. He caught his first butterfly in 1906, at the age of 7. 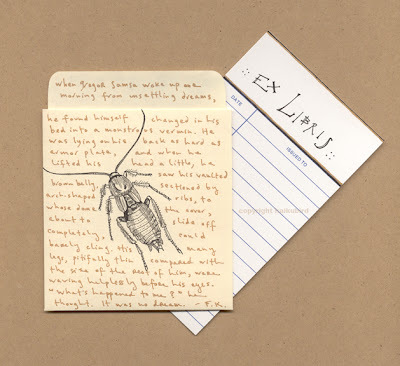 This ex libris is a tribute to Nabokov and his dual passions for science and literature. 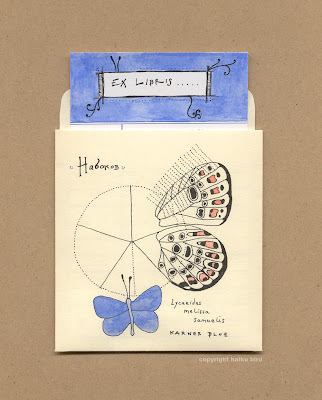 It features my own interpretation of one of Nabokov's illustrations of a scale-row classification system of the Karner Blue (Lycaeides melissa samuelis), the butterfly he is perhaps most famous for studying, tracking and helping to classify. Media: Pen & ink and gouache on a new set of an authentic library circulation card and manila pocket. The back of the circulation card will be initialed and dated by the artist. until the shadows grew long. Pen & ink, perforated "stamp" paper, copper wire stitching, black drawing paper (front); book page and iridescent acrylic medium (back); affixed to 140 lb Canson watercolor paper. 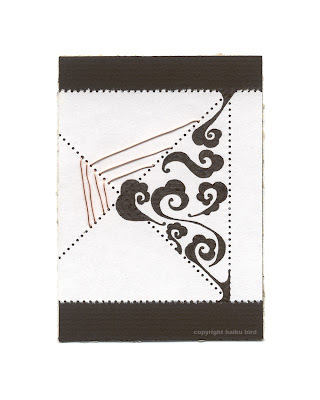 3.5 x 2.5 inches (standard ACEO size). Pen & ink, perforated "stamp" paper, copper wire stitching, black drawing paper (front); book page and acrylic paint (back); affixed to 140 lb Canson watercolor paper. This photograph was taken on an early evening photo-trek through San Francisco, when the light was just right. One of those moments when you stop and think how lucky you are to be. The image itself is about 5.25 x 8, printed on 8 x 10 paper for a nicely-sized white border. It does not need to be matted to be framed, though it can be. This photograph was taken on the street in San Francisco. It is part of a larger assemblage-mural in the Mission District. 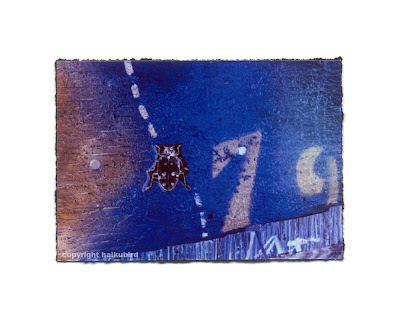 The ladybug was just a xeroxed piece of paper stapled on to a wall painted, stenciled, and layered with chipboard. I worked with the original photo digitally to get the colors I wanted for the final effect. The image itself is approximately 3 x 5 inches (2.88 x 5.12), printed on 5 x 7 paper for a nicely-sized white border. 05.03.07 UPDATE: currently this photo is being offered only as an ACEO. 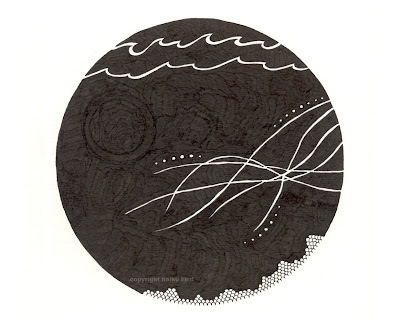 "Below," an abstract pen & ink drawing, inspired by the Etsy Creative Challenge. $10 (that's 20%) from the sale of this drawing will be donated directly to the Monterey Bay Aquarium (CA), a 4-star rated charity by www.charitynavigator.org. "Opened in 1984, the Monterey Bay Aquarium seeks to inspire conservation of the oceans. From the beginning, we planned our permanent exhibits as a walk through Monterey Bay's beautiful natural communities. In 1996, we almost doubled our exhibit space with the opening of the Outer Bay Wing, devoted to the open ocean and deep sea. The main feature is the Outer Bay Waters exhibit, the one-million-gallon tank containing tuna, sharks and sea turtles. The aquarium has an active research program. We have groups working on sea otter conservation and tuna conservation biology. About 1.8 million people visit us each year." When you purchase this drawing, I will immediately donate $10 to the Monterey Bay Aquarium online. Printed confirmation of the donation will be included in the package you receive. This is an original drawing, not a print. Pen & ink on 140 lb Canson watercolor paper. 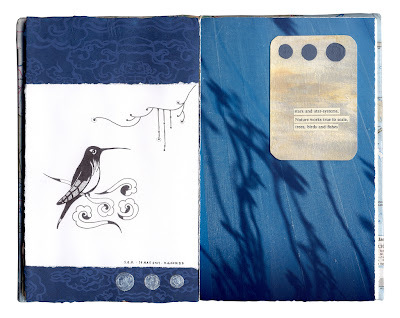 Haiku Bird began as a project of creating unique mixed-media drawings and paintings pairing hummingbirds and collaged cut-paper original haiku. 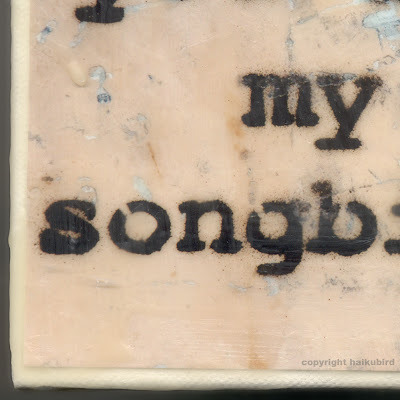 While Haiku Bird's pieces are no longer always in the format of hummingbird + haiku, the challenge and allure of creating new work that explores similar themes repeatedly and all of the potential possibilities therein is returned to again and again. The work in this blog is for sale at the haiku bird etsy.com shop. The blog posts are updated each time a piece is sold. 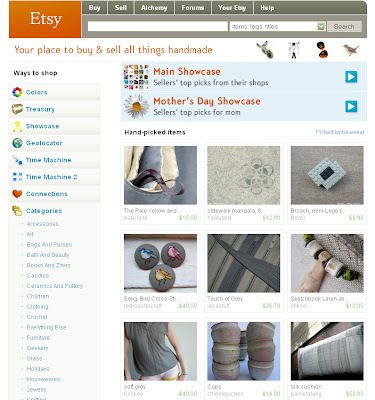 To easily see what is available and what is not, click on the for sale label below. Clicking the sold label will show you what pieces have sold. I prefer not to have comments enabled, but please feel free to e-mail me if you have any questions or comments about my work. Commissions and custom work are always considered; please see my etsy shop profile page for details. To join the general e-mail list to receive not-too-frequent e-mails about new projects, news, sales, and the like, please send me your e-mail address. Alternatively, if you'd like to receive an e-mail each time new drawings are posted, please send me your address and specify that in your message. Under no circumstances will the list ever be shared, and you can always unsubscribe.